"Combats" redirects here. For fighting, warfare or combat, see Combat. Cargo pants or cargo trousers, also sometimes called combat trousers (or combats) after their original military purpose, are loosely cut pants originally designed for tough, outdoor activities, and whose design is distinguished by one or more cargo pockets. Cargo pants have become popular in urban areas as well, since they are convenient for carrying items during day trips on foot. Cargo shorts are a shorts-length version. A cargo pocket is a form of a patch pocket, often with accordion folds for increased capacity closed with a flap secured by snap, button, magnet, or Velcro common on battledress and hunting clothing. 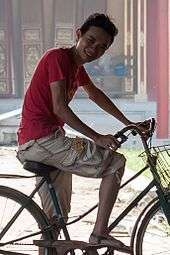 In some designs, cargo pockets may be hidden within the legs. The garments are characteristically designed to allow bending at the knee and hip, and are sewn with felled seams for strength and durability. Battle Dress were first worn by members of the British Armed Forces in 1938, and were introduced to the United States in the mid-1940s during World War II. 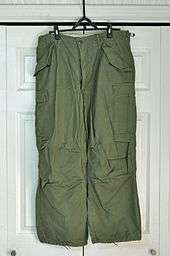 The large pockets characteristic of cargo pants were originally designed for British forces to hold Field dressing (bandage) and maps and other items. The concept was copied in the U.S. Paratrooper uniform to allow more room to hold K rations and extra ammunition. EMT pants are cargo pants which have 6-way cargo/scissor pockets on one or both legs, each with a hidden zippered pocket on top of cargo pocket, a bellowed flap pocket with increased carrying capacity, Besom pockets on calves for glove storage, and 3 slots for scissors (two fitted with snap closures). ↑ Loschek, Ingrid (2009). When clothes become fashion : design and innovation systems (English ed.). Oxford: Berg. p. 107. ISBN 9781847883667. ↑ "Cargo Pants". Cracked.com. Retrieved 19 February 2013.